I am going to give you a perspective that hopefully will empower you to embrace the rain and have a wonderful wedding day. After all it is one of the most special days of your life. This is from a Hindu tradition, since you are “tying the knot.” To do so when it’s raining will make it wet, causing it to be tied tighter and consequently very hard to untie — a marriage made to last. As we all know water is used to clean and purify. 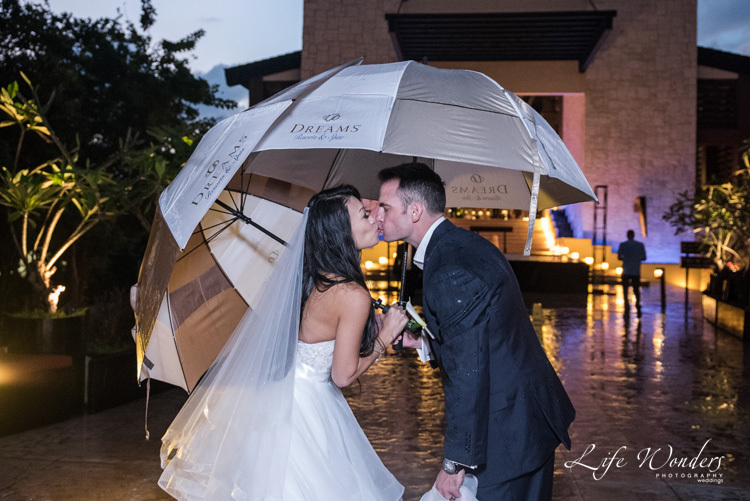 Some believe rain on your wedding day means your past has been cleansed and this rain on your Riviera Maya wedding signifies a fresh new start. So go out and dance in the rain! This wedding day is all about you. Everyone’s attention is on the newlyweds. 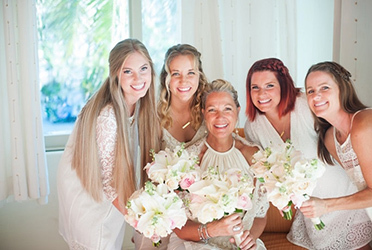 When you are worried or stressed, your bridal party, parents and friends are all naturally concerned and trying to figure out how to make you feel relaxed and at ease. When you are smiling enjoying yourself and being playful, all of your guests are smiling and celebrating your wedding too. But the opposite is also true. When you are concerned about the rain, everyone is concerned with you. I’ve seen brides waste a whole morning looking at the weather channel in their room and fretting. As a result, everyone around her was anxious and trying to calm her down, which was not working. We know we can’t change the things we can’t control, but we can change what’s within our control. 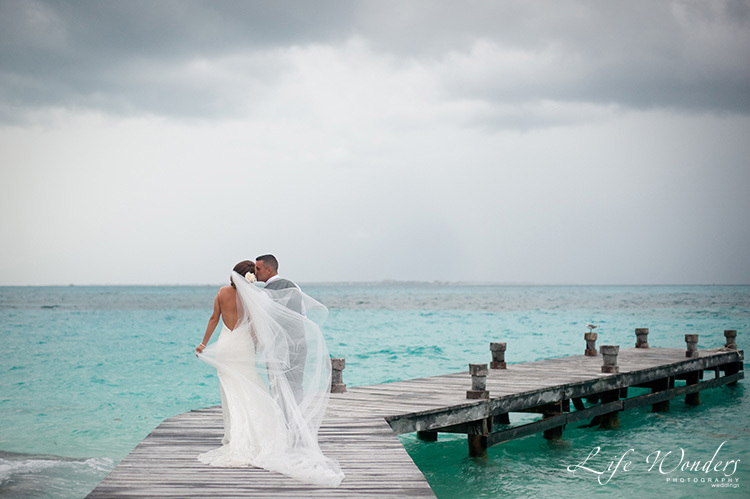 This also applies to your Cancun, Riviera Maya wedding weather on your wedding day. When you focus on what you can change you also alleviate your anxiety and stress levels. Research shows that 85% of the things we worry about never actually happen. That’s an amazing amount of worrying we do for nothing! You can discuss backup plans and alternative venues in case of rain and confirm on the day of. 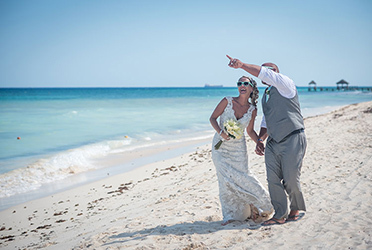 Coordinators deal with this on a daily basis so they know the options and how to ensure you have a fabulous Riviera Maya wedding. Turn your focus to being in the moment. company as well as all your friends and family. 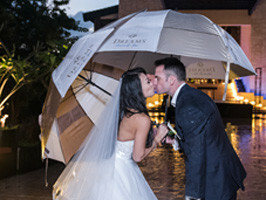 Talk about the rain, laugh about it and most of all embrace it with your wedding guests. It will be a great story to tell. On my wedding day, my husband, Gulam stayed with his best man and made sure our wedding hall was all cleaned up and empty so we wouldn’t incur any deposit penalties. This was at 2am and a freak one-hour thunderstorm had just finished. On the way to the hotel they got a flat tire because a metal manhole cover had been thrown up into the air due to the extreme water surge and it had broken in pieces on the highway. Needless to say, Gulam didn’t get to the hotel room until 5:30 in the morning! What a crazy story and an unforgettable wedding night. We look back on it and know it was our special night unlike any other. What an adventure to the start of our lives together. That was 17 years ago, we’re still married and we still look at our photos with fondness…and now we share this with our kids! I wish for you to do the same with the photographs I capture of your special day. Remember, this is the first day in a whole lifetime of adventures you will encounter. Look up the weather using the maritime site most of the fishermen and captains use. It’s more accurate and gives winds, precipitation, waves and more. Goto WindGuru to see the reports: https://www.windguru.cz/. your concept of rain is very different than the rainfall we get here. 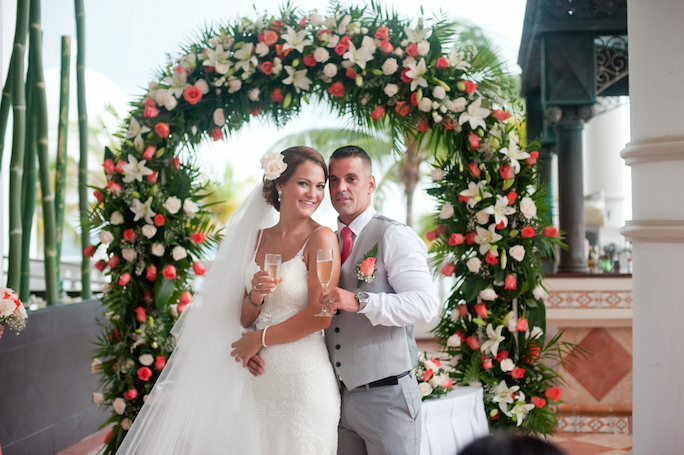 At the time of negotiating your wedding contract, you should discuss what the resort will do in case of rain. The resort will have alternative plans and venues. Just be sure to have this written into your contract. 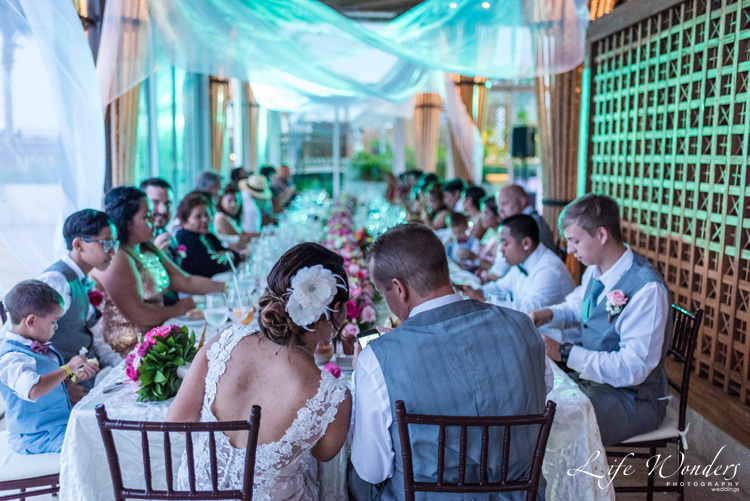 If you are planning to have an outdoor wedding reception make sure to understand what alternatives they have for you if it rains during the various events of your wedding. Ariana and Michael planned ahead for their rainy reception and the wedding coordinated it beautifully. 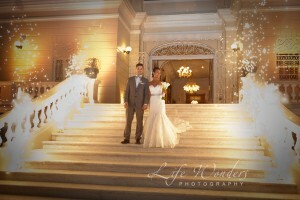 We captured some beautiful memories of their reception despite the rain. Yes, you read that correctly. 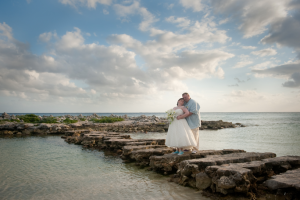 Your Riviera Maya wedding photographs will be amazing because whether it’s only threatening to rain, to a light sprinkle or to a heavy downpour – the possibilities of capturing unique, breathtaking photographs are limitless! Yes, bring your heels. But also bring matching rain boots. Imagine a light rain, puddles and you with a red rose bridal bouquet walking through the puddles and as you hold your dress up from touching the water puddles. That means we see you wearing matching bold red rain boots. The photographs we can capture are priceless! 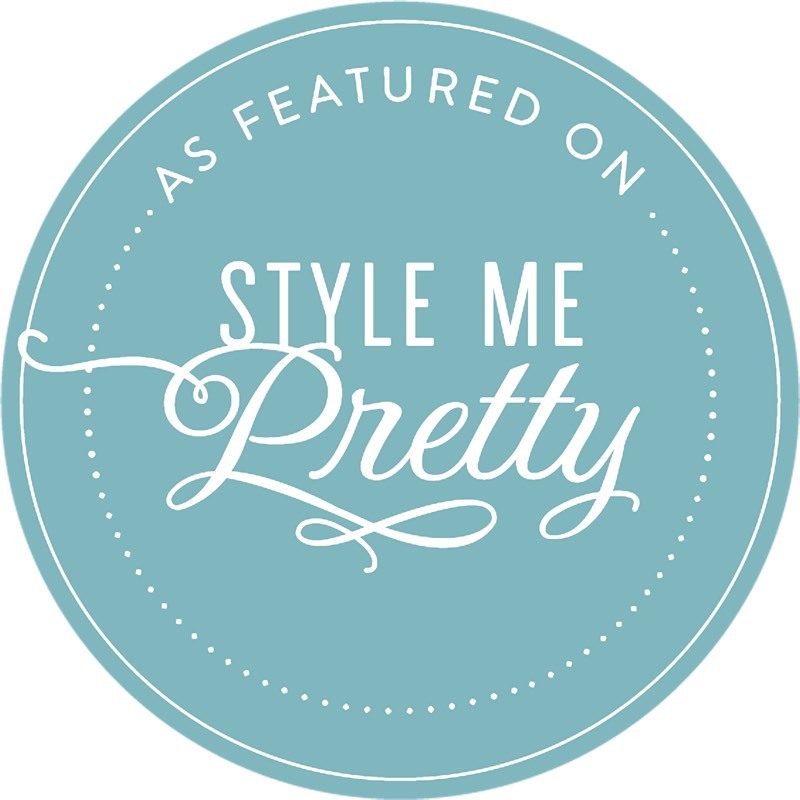 Bring umbrellas that are bold, transparent, matching or contrasting your wedding colors. The umbrella will definitely serve its purpose of being functional and keeping you dry. But we can be playful and creative throughout the day. How you ask? Imagine you are walking to the ceremony with your bridesmaids, I’m photographing you from behind and your beautifully colored umbrella is leaning on your shoulder covering you but I get a wonderful photograph of you, your wedding dress, a bright colored umbrella and the blue ocean as your backdrop. Then you turn your head to the left, peak around the umbrella and give me a wonderful smile — click! — a timeless photo. Love it! So let’s play and have fun in the rain! Yes, clouds are great! First they will keep you and your guests cool, because usually there will be a slight breeze and the sun won’t be hot overhead. Also, your photographs will have a natural dramatic effect with the clouds in background. 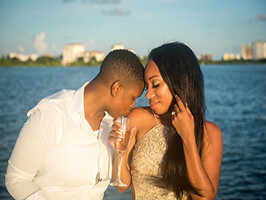 Imagine a slightly cloudy sky with rays of sunset orange sunlight peeking out and the two of you on the pier with your veil lifted slightly by the breeze. Wow – I can’t wait to capture that for you! 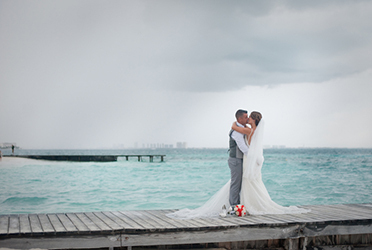 Dana and Vlad initially were worried about rain on their Riviera maya wedding day, but they were so happy with the dramatic ocean colors and the luminous clouds – their rainy day wedding photographs are one of a kind! I am so excited about your wedding. Rain or shine, I will be as creative as you want! We will have fun and be adventurous. 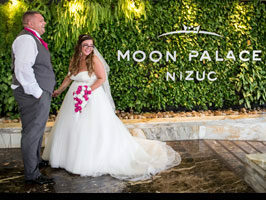 I am willing to try almost anything to make your wedding extra special, capturing unique and beautiful memories of your special Riviera Maya wedding day! Let your spirit shine on a rainy wedding day and together we’ll create magic. 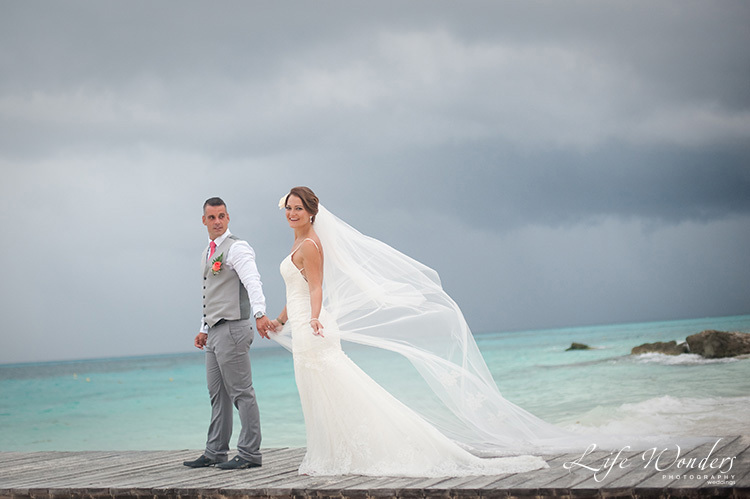 When you are ready to find the best wedding photographers in Cancun, Playa del Carmen, contact us. 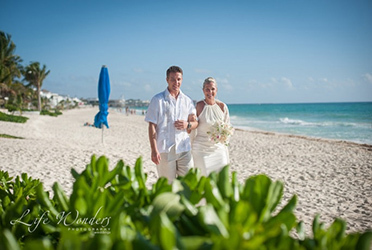 We’re Life Wonders Photography, your first choice for wedding photography in Riviera Maya, Mexico because we care about you having a beautiful wedding experience.